Note: Dirk Greyson is an alias of Andrew Grey. After things fell apart in New York, Brantley Calderone did what any sane person would do he bought a farm and left the city looking to make a new life for himself...he just didn't plan on that life including a dead body on his front porch at the end of his first week. Nor did he count on it including a sheriff who pushed every hot button he has. When Mack pulled up to the house with the dead body on it and realized that he was more interested in the hot and very much alive owner as more than just a prime suspect. Mack learns in short order that first impression can be wrong and it doesn't take Mack long to figure out that his first impression was deceptive and as events unfold he realizes that not only is Brantley not a suspect, he's a potential victim. I liked Brantley, he was determined not to give in to his fear and run back to New York no matter how tempting the idea became and I can well imagine that having someone try to kill you would be a real motivator to get the hell out of Dodge. But when push came to shove Brantley pulled on his big boy pants and held his ground and without fail Mack had his back. I might have warmed up to Brantley a little quicker than Mack but that didn't mean that I didn't appreciate Mack. I loved that Mack wasn't afraid to let Brantley know how he felt. As Mack and Brantley pull together to solve the mystery and keep anyone else from being hurt or worse not only does the pressure to find a solution increase but feelings between Mack and Brantley change and Mack's desire to keep Brantley safe becomes more personal than professional. I found myself engaged by both the romance between the MCs and the mystery in this one even though I was fairly sure who it was I still enjoyed the journey that the author took us one to get there. Overall I enjoyed this story but I have to admit that ending was maybe just a little bit to much sunshine and rainbows for me to buy into but sometimes it's nice to get the sunshine and rainbows in my books because real life doesn't always have them to offer when life goes off the rails. I've left my thoughts on the audio portion of this book for last because truthfully this one was a real challenge for me. I listened to the sample on audible.com before I requested this one and honestly it seemed ok, I really didn't think there was going to be an issue...I was wrong ok? Because about an hour into the book I picked up on the fact that what sounded like a slow easy drawl after only a few minutes turned into more of a sing-songy voice and truthfully just did not enhance the story for me especially as I began to feel like it was getting a bit challenging to distinguish the character voices apart as I didn't find the voices of the MCs to be overly distinctive. This was my first audio experience with Mark Westfield as the narrator and truthfully probably my last as well. I know he's a very popular narrator especially with fans of Charlie Cochet's THIRDS series and I'm cool with that. Once again this isn't a case of right or wrong it's just a case of this narrator's voice didn't work for me. At the end of the story it's a case of the story was easily a 3.5 possibly a 4 star read for me but the audio only gets 3 stars from me because while this was by no means my best audio book experience I've had worse...a lot worse so I'm calling it a day at 3.5 stars for this one and moving on to my next adventure. 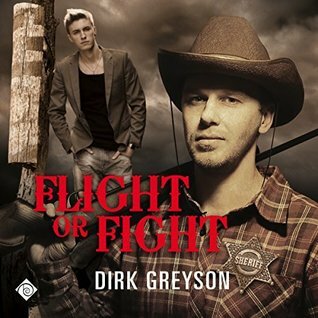 An audio book of 'Flight or Fight' was graciously provided by the publisher in exchange for an honest review.